Edison Pen Co – Edison Nouveau Autumn Special Edition is Here….Get One for Free! Edison Nouveau Autumn Special Edition is Here….Get One for Free! 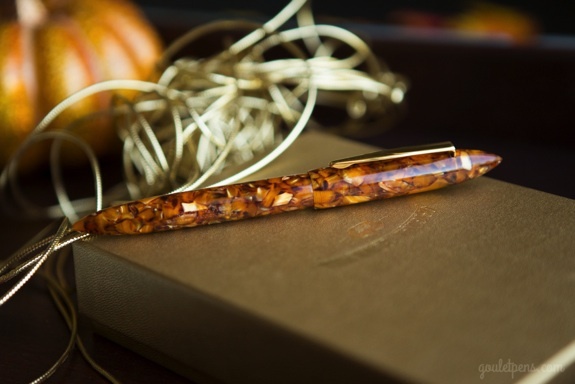 The Edison Nouveau Autumn Special Edition Pen is here! Here is the blog post announcing this pen. There’s plenty of content there that I will not duplicate within this blog post, so be sure to follow the link above to check out the pen, along with a nice video announcing this pen. Remember the way that these Seasonal Special Editions work is that we will make as many pens as will sell for that given season, and once the season is over, they will be gone! Also, to commemorate the Goulet’s 1,000th blog post, they are giving away one of these Autumn pens! Check out this blog post to see how you can qualify to win one of these pens! As a side note, the buying period for the 2014 LE Glenmont has concluded! We will be putting up some blog posts soon, and should begin manufacting of these pens next week! Stay tuned!